Tired of Painting and Staining? Invest in a Low Maintenance Deck! When we think decks, we often think of traditional wood decks that lead out from the back door out into the back yard. However, it can be easy to forget that with wood decks come the recurring refinishing and resealing process that is necessary to keep them looking great and functional. If you want the freedom from worrying that your deck will crack, split, or warp if you neglect it, let Freedom Fence and Home tell you about the benefits of a low maintenance deck! 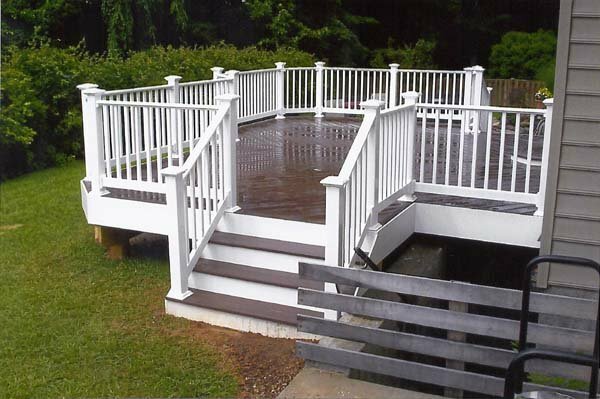 Safety: Unlike traditional wood decks, wood-plastic composite decks are splinter-free and slip-resistant. Your kids and pets will appreciate this! Durability: Hot summers, frigid winters, and wet springs, all typical to Bel Air, can quickly take their toll on traditional wood decks. Composite decks make for a low maintenance deck that you can count on. Increased Home Value: Remodeling Magazine put together a cost vs. value report in 2012 and estimated a 62.8% return on investment for composite decks. Not a bad amount at all! Wider variety of options: Manufactures offer a variety of color choices, some of which look like traditional lumber or exotic hardwood. Have the look you’ve always dreamed of without the high expense and guaranteed low maintenance! Long term cost: While it is true that low maintenance decks can be more expensive up front, they more than pay for themselves over the long run. Because you don’t have to add in the expense of on-going maintenance, including cleaning and sealing every few years, a composite low maintenance deck can pay for itself in as little as five years. More importantly, you don’t have to worry about replacing warped or splintered boards. Traditional wood decks may need to be replaced in less than ten years, while the longevity of a composite deck is far longer. At Freedom Fence and Home, we specialize in the installation of low maintenance decks in the Bel Air area. Our crews are experienced, knowledgeable, and high skilled, ensuring each deck we build is properly installed to meet your expectations. Every deck we build comes with a five year limited warranty on workmanship and material. To get started on your new low maintenance deck installation and to receive a free estimate, call us at (443)-271-6841 or click here today. You can also follow Freedom Fence and Home on Pinterest, Google+, Twitter, and Facebook. This entry was posted on Tuesday, June 10th, 2014	at 3:49 pm	. Both comments and pings are currently closed.